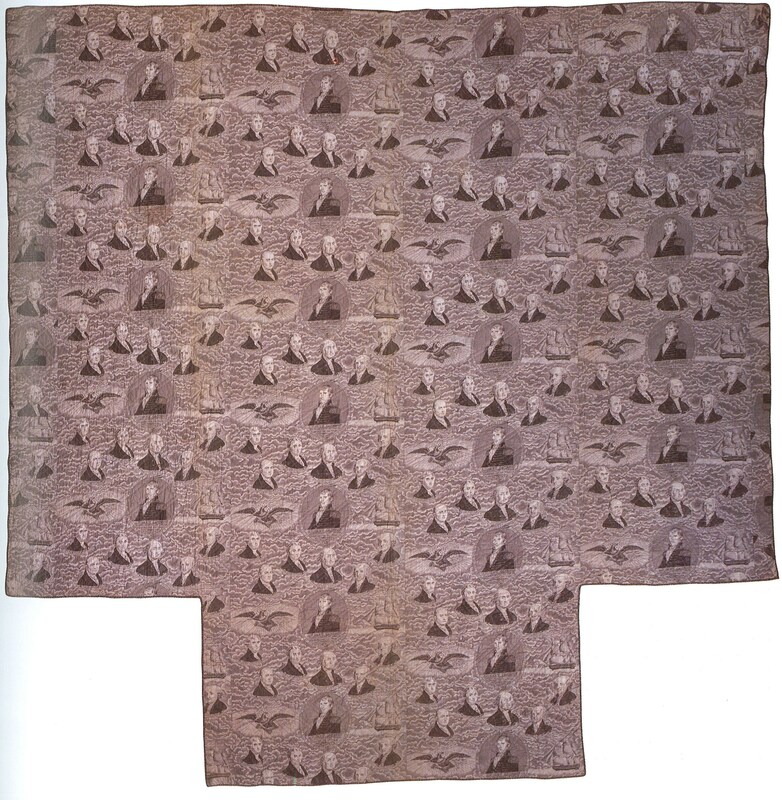 American, "Presidents to Jackson" wholecloth quilt, 1829-37. Winterthur Museum, Bequest of Henry Francis duPont. This month’s book salon found me revisiting a book I first read in college: How to Make an American Quilt by Whitney Otto. Well, we all know that just as we can never step into the same river, we can never read the same book. Happily, it did read like a new book–partly because I didn’t have to write a paper about it afterwards– but mostly because I read it surrounded by 40 handmade quilts on display in the American Quilts exhibition. However, my impression of the book this time was that, as one of our salon attendees remarked: “This isn’t really a story about quilts; it’s a story about women’s lives”. Her comment launched our spirited discussion, and inspired us to consider if we could say the same of the exhibition. As a non-quilter, I certainly admire the skill and artistry displayed in the quilts on view, but more than that, I am interested in the lives of the women who created them during the 18th and 19th centuries. Women who were not allowed to vote, who were largely defined by whom they married, but who worked for weeks, for months, for years to express themselves in an exquisite quilt. So this time when I read Otto’s words, “Save your opinions for your quilt” (p.13), I thought immediately of Mary Remington, who boldly placed her own family’s coat of arms, instead of her husband’s name, at the center of her 1815 wedding quilt, and the unknown woman who made a quilt celebrating Andrew Jackson’s 1828 presidential victory. I revisited the quilts in the gallery, now imagining them off the wall and laying beneath the hands of their makers 200 years ago. Women sitting quietly at work, meticulously stitching their opinions, their voices, into the fabric; stitch after stitch after stitch. Then WHOOSH—that gallery head rush I get when a familiar piece of art opens up in a new way and knowing of the artist comes ever so slightly more into focus. This is what I most enjoy about the book salon program. When literature and art collide, you have a pretty good chance of opening up dusty passages of the mind with fresh insight. Now on to September’s book! Intimate Images of Love and Loss: Portrait Miniatures meet Persuasion by Jane Austen. See you on September 25th for our next book salon. 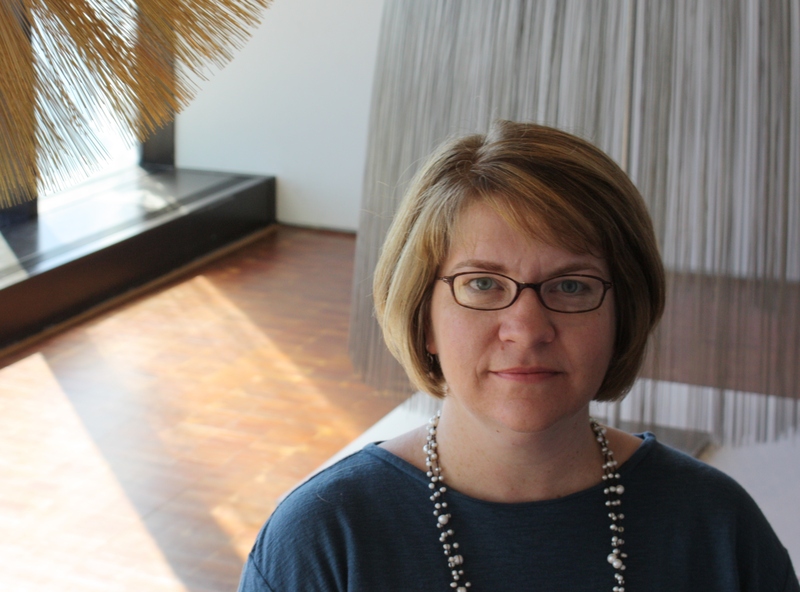 Amy Kirschke coordinates gallery talks, express talks, lectures, symposia, book salons and classes for the Art Museum, and works with the docent training and continuing education programs. This entry was posted in Education and tagged American Quilts, Book Salon. Bookmark the permalink.